Trash X cards from the top of R&D. The Runner trashes 1 installed program or piece of hardware with an install cost of X or less. X is equal to or less than the highest install cost among all installed programs and pieces of hardware. Trash X cards from the top of R&D: First, to diminish this drawback you'll want the possibility to put cards from Archives into R&D or HQ. The main answers should already in your deck: Jackson Howard. With JH(or similar cards) and a good amount of ICE, you'll be perfectly fine to use this cards. The Runner trashes the card: Well, this restriction is there for a good reason: game balance. Otherwise the runner won't have indirect way to deal with it. But how do you play around this and make this card not be so bad? 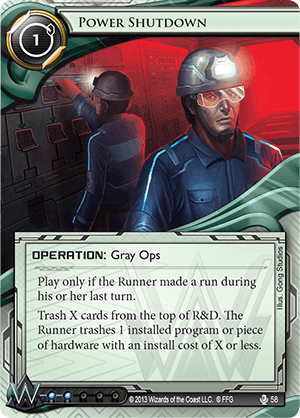 Is it easy, in Android:Netrunner some of the most powerful cards on the runner side are cheap! This is basically a counter to the best cheap program/hardware the runner have. Now let's look at the advantages. Power Shutdown offer a possibility that no other corp card's lets you do: Trash a program or hardware without any interaction from the runner side. Here's a short list of candidate to use it for: SMC, Fearie, Datasucker, Refractor, Inti, Sharpshooter and Clone Chip. Power Shutdown +Jackson Howard + Accelerated Diagnostics. A killer combo that allow you to play Sea Source and 2 Schorched Earth from your deck without holding any in HQ. Still, it takes a good amount of setup to make it work. In summary, Power Shutdown is a strong card to get rid of powerful and cheap program/hardware the runner have and can be use for combo purposes. My note: 4/5: Despite been situational and have drawbacks, it's still one of the best utility card in the game.